A movie based on the Monkey Island games was once very close to being reality. A script was in development and Steven Spielberg was going to produce. Spielberg had asked Ted Elliot to help with the story. Unfortunatly, the MI movie never saw the light of day and a few years later Ted Elliot wrote ‘Pirates of the Caribbean: The Curse of the Black Pearl’. If you’ve seen the movie it’s not hard to imagine that Elliot borrowed a few things from his Monkey Island script. All this is not officially confirmed by any parties of course, but many details have surfaced over the years. 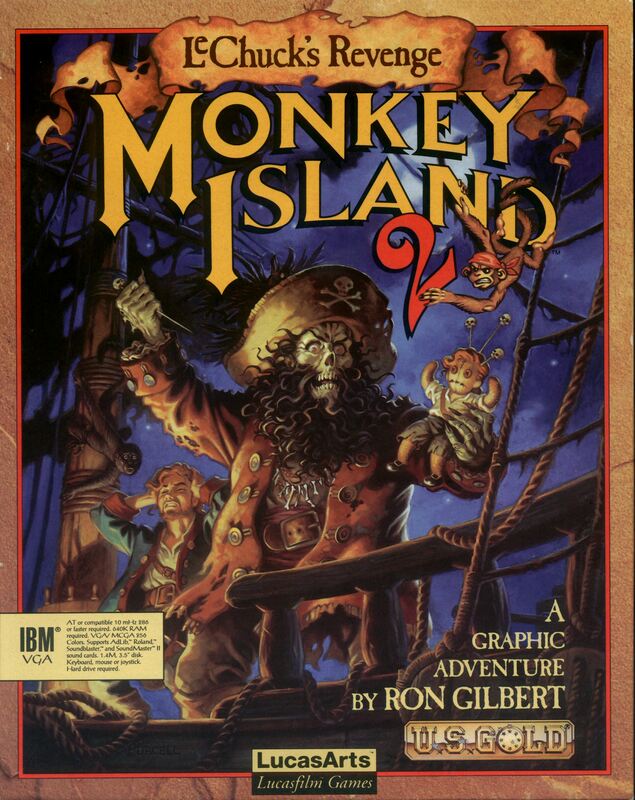 An interesting fact is also that the fourth PotC movie, which is currently filming, is based on the book ‘On Stranger Tides’ from which Ron Gilbert also drew inspiration for the original Monkey Island games. Check out the article for the Monkey Island movie and let’s hope we’ll see it one day. With the recent news that Bill Tiller is interested in working on a special edition of The Curse of Monkey Island (now we just need LucasArts to say yes), I thought it would be fun to explore my favourite location from that game: Puerto Pollo. There’s always something to do on this lovely island. If you fancy some greasy food or maggoty biscuits, Blondebeard’s Chicken Shoppe is the place to go. There’s plenty to choose from on the menu. If all that chicken got you thirsty, maybe it’s time to pay a visit to Kenny‘s lemonade stand. With his bottomless mug policy, you really can’t go wrong. If you’re more culturally inclined, maybe the theatre is something for you. Of course, the Puerto Pollo pirates follow the latest fashion, and now you can too! Just go to The Barbery Coast and ask for a new hairdo – you won’t be disappointed! You should also consider paying a visit to the town’s Field of Honour, where such magnificent sporting events as the banjo duel and the caber toss take place. That’s it for our little vacation to Puerto Pollo, the jewel in the Caribbean’s crown! Celebrating the long-awaited release of Tales of Monkey Island on the PlayStation3, Telltale announced today that the entire five-episode series will be available for $19.99 on PlayStation®Network and on Telltale’s website, starting from June 15. “Tales of Monkey Island has been an incredible hit, and we’re excited to bring it to PS3 gamers next week,” says Telltale Senior VP of Marketing Steve Allison. “If you haven’t grabbed Tales of Monkey Island yet, now is a great time”. Tales of Monkey Island will also be released on PlayStation Network in Europe, with final dates to be announced shortly. In other related news, the same game company released some sort of teaser for their upcoming titles: Back to the Future and Jurassic Park, both being scheduled for this winter. Take a look! When we first meet Stan he is running a used shipyard on Mêlée Island. He has apparently been there some time: all the other characters of the island know him by reputation, and some years ago he sold Herman Toothrot a ship to sail to Monkey Island. Despite his numerous cameos in the series, Stan’s appearance has remained fairly constant. He is a tall, broad-shouldered man with an overbearing manner. He wears an oversized check jacket and a wide-brimmed hat. When he’s talking, he waves his arms about rapidly. When he’s listening, he taps his foot impatiently. His jacket is a recurring visual gag seen throughout the series. Whenever Stan flails his arms around hysterically the check-pattern on his jacket remains stationary. This was originally because of technical restrictions but has since become a standard part of his appearance. He was voiced by Pat Pinney in The Curse of Monkey Island. Like Elaine Marley, his voice actor changed for his second voiced appearance in the fourth game. In “The Trial and Execution of Guybrush Threepwood“, he was voiced by Gavin Hammon. Pat Pinney returned to voice Stan in The Secret of Monkey Island: Special Edition and the upcoming Monkey Island 2: LeChuck’s Revenge: Special Edition. The Tingler reports on LucasForums that Steam has added a page to its store for the Monkey Island 2 Special Edition. There’s no release date on there yet, but earlier Mixnmojo reported that PSN seems to think it will be released in July. In any case, everything points to an imminent release, and we will undoubtedly get more news when E3 comes around.